A Quick 5-minute summer smoothie made with all vegan ingredients. 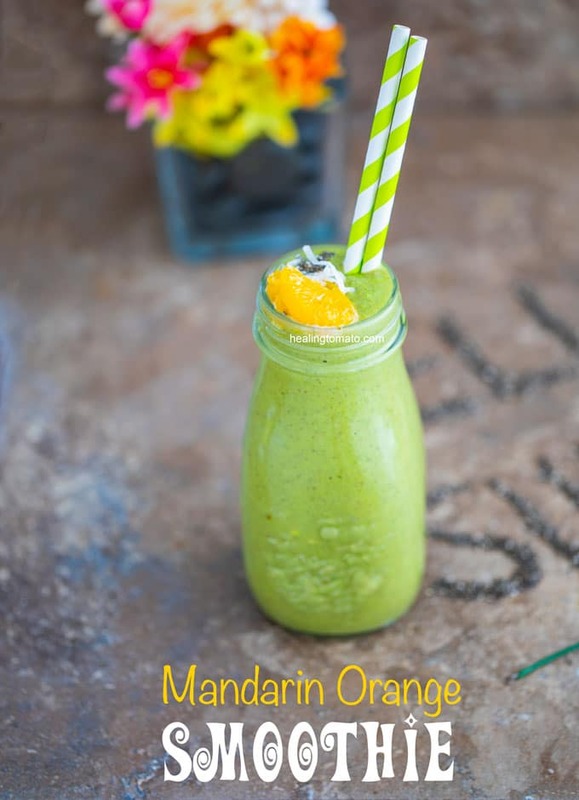 This Mandarin orange smoothie has only a few ingredients and is packed with antioxidants, vitamin C, K and many vitamin B’s. 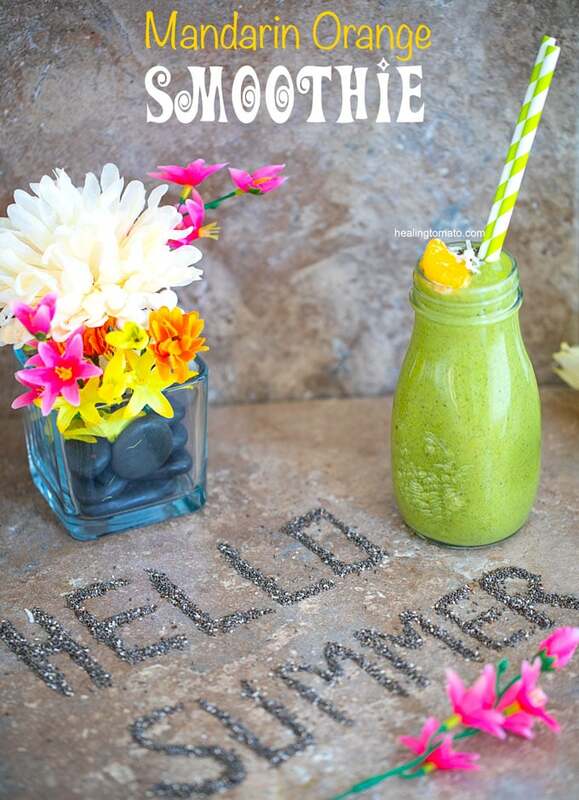 When summer rolls around, do you feel like you need a new smoothie recipe? I always like new smoothie recipes for those hot summer afternoons! Last summer, a fan favorite was my tropical fruit smoothie. 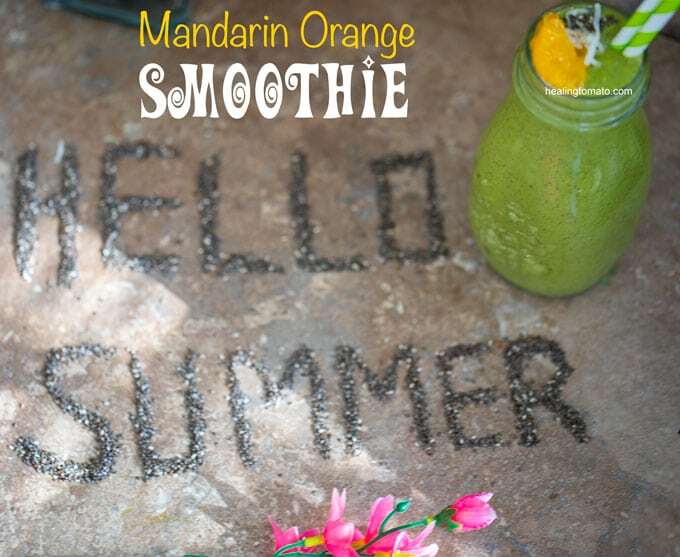 No summer is complete without a good summer smoothie. This time, I used Mandarin oranges which I never considered using in smoothies until now. I had a can of oranges left over after creating a cucumber salad recipe for Jenny Melrose Family’s blog. These oranges were too good and begging to be put into another recipe! I also put some fresh spinach in this recipe because it works so well with mandarin oranges and chia seeds. I didn’t need to add any protein powder to this recipe because all the ingredients contribute a healthy dose of protein to this recipe. The best part is that this recipe doesn’t require any chopping, cutting or cooking. 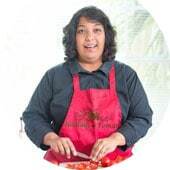 I just dumped all the ingredients into my blender and it was ready in a few minutes. It didn’t take me more than 5 minutes to make it. If you like green smoothies as much as I do, you are going to like my other green smoothies like Ultimate Antioxidant Blast Green Smoothie or my 5-ingredient Avocado Smoothie. 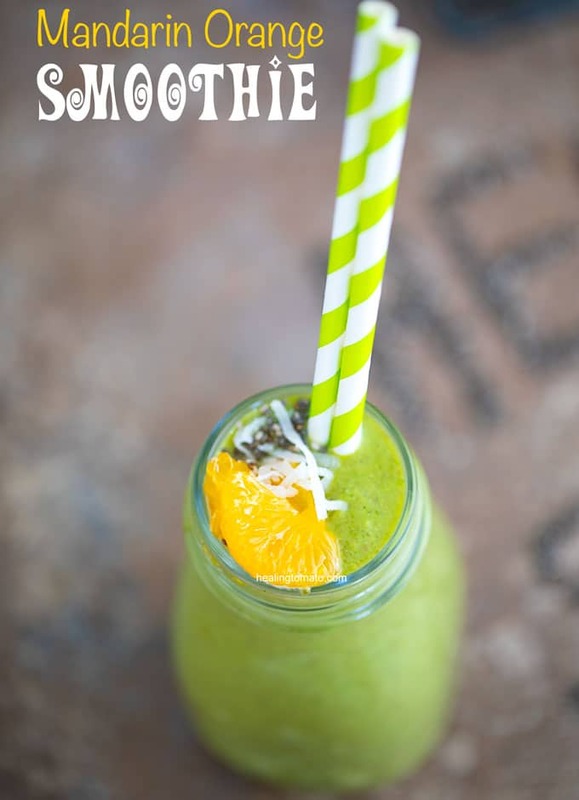 If you are smoothie adventurous, you HAVE to try my pineapple smoothie with jalapeno! I go the spicy route with that recipe! Or, if you are in the mood for some decadent smoothie recipe, try my chocolate smoothie bowl with peanut butter. Its a delicious and decadent recipe that you can’t resist! 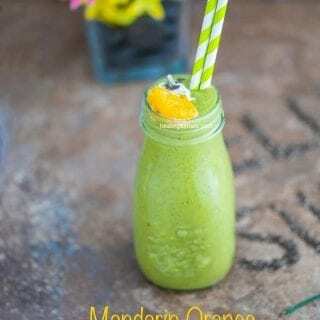 Can Mandarin Orange smoothie be made ahead? If you like to meal prep your smoothies by putting all the ingredients into a ziploc bag and make smoothies as necessary, you will love this one too! You can put the spinach, banana, mandarin orange and ginger into a ziploc bag and freeze. The remaining ingredients can be added at the time you make the smoothie. Can I use frozen spinach in this smoothie recipe? I wouldn’t recommend buying the store bought frozen spinach in this recipe. It makes the smoothie more watery in texture and the taste is awful. What I like to do is buy fresh spinach and freeze it along with the other ingredients. This way, the spinach is going to taste just as good. Whenever possible, use fresh spinach. If you cannot use it fresh, freeze it for future use. Also, no need to thaw the ziploc bag when you are ready to make the smoothie. Place all the ingredients into the blender right out of the freezer and blend. Can I use canned Mandarin oranges for this recipe? Absolutely. I also used the canned one for this recipe, but, fresh would have worked just as well. I used a brand of Mandarin orange segments in a light syrup canned by my local grocery store. You can also use these (Affiliate Link) Dole Mandarin Oranges in a light syrup. You can also use fresh Mandarins in this recipe. Just add about 3 Tbsp of agave to it. Does this smoothie travel well? Absolutely! What I did was put it into smoothie jars and take it to the park on a hot summer day! Put it into coolers so that it stays cold until you are ready to drink it. This smoothie is very portable. What are your favorite summer smoothies to make? This had an interesting woodsy flavor with the nuts and ginger. Definitely different from most fruit smoothies but we really liked it. Despite having 15 ozs of oranges in it (I used actual mandarin oranges and weighed them – they are about an ounce each) we didn’t taste orange – just give it tang. It will be a great vitamin C boost in winter too. We had to add ice in Vitamix since our oranges and spinach weren’t frozen to prevent it from being warm. My kids even drank it. We’ll be adding this to our smoothie rotation for the Vitamin C.
Thank you so much, Tracie. I am so glad you tried and liked it. I put a little less mandarins in mine, but, I will up the amount next time I make it. I really liked how much energy I got after drinking it.